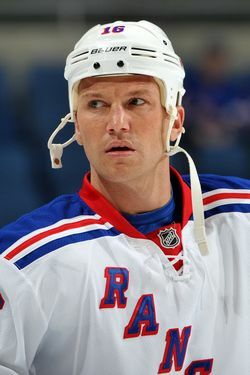 This week, the Rangers informed Sean Avery that he wouldn't be on the postseason roster of the AHL's Connecticut Whale, and that he no longer needed to report for practice or games. The popular winger has left the organization before, of course, but after a season that saw him twice waived by the team, it appears to be permanent this time. Here, now, a look back at Avery's many departures and returns, plus a quote from the time for each. The Rangers acquire Avery and prospect John Seymour from the Kings in exchange for Jason Ward and the rights to unsigned forwards Marc-Andre Cliche and Jan Marek. After becoming a fan favorite during his season-and-a-half in New York, Avery signed a four-year, $15.5 million contract with the Stars during free agency. The Stars placed Avery on waivers, and as expected, the Rangers claimed him, officially beginning his second stint with the team. While the team was in Europe prior to the start of the regular season, Avery was placed on waivers. When he went unclaimed, he was assigned to the Connecticut Whale of the AHL. At the Rangers' home opener, fans in the 400-level displayed a huge banner supporting Avery's return to the NHL club. They'd get their wish: After a 3-3-3 start, and with Mike Rupp out with an injury, the Rangers placed Avery on re-entry waivers. He went unclaimed, and made his season debut with the team on November 5. The Rangers once again place Avery on waivers. Once again, Avery went unclaimed on waivers and was assigned to Connecticut. He hadn't appeared in a game for the Whale since January 27, and this week, he wasn't included on the team's "clear" list, which, via Steve Zipay, makes players eligible for the playoffs. Avery hasn't commented on the decision, but last month, he talked with Women's Wear Daily about whether he has any ill will towards the Rangers. Said Avery: "How could I be upset? I had an amazing time here. I have so many friends that I’ve made out of this. I’ve basically forged a career out of living here."